Our automaker's heavy-duty pickup has been billed as one of the longest-lasting in America. Check out any model in the RAM HD lineup over the years, and you'll find it was for a good reason. Now, as the new RAM 2500 is set to join us soon no less than a redefinition of the meaning of "full-size truck," so it remains for a new 2019 model year, too. Check it out right here at Mann Chrysler Dodge Jeep Ram of Mt Sterling! Choose the capable base Tradesman trim. Step up to Big Horn. Command the off-road from an ultra-rugged Power Wagon. Get the best of both worlds in Laramie or Laramie Longhorn or go full luxury in a trim like Limited. 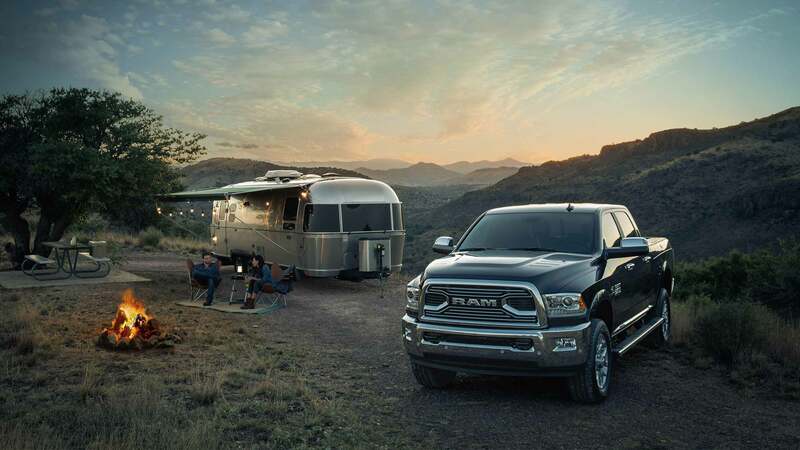 No matter which model you make that connection with, you'll find RAM 2500 built tough, with upgraded steel frames, enhanced cross members, a new braking system, and bigger axles, among other improvements. But it's what's under the hood that drives capability nearly unrivaled. Opt for a model sporting a 410-horsepower, 6.4-liter HEMI® V8 paired with a new ZF eight-speed automatic transmission, and you can take advantage of torque up to 429 pound-feet. Move up to the 6.4-liter V8 in models like RAM 2500 Power Wagon, and you get a power bump to 450 horsepower, a class best. However, it's with the available 400-horsepower Cummins high-output turbo-diesel engine and its AISIN six-speed auto that the ability to tackle the biggest tows and hauls takes shape: it's capable of delivering 1,000 crushing pound-feet of torque. That means not only a 4,050-pound payload capacity but also a best-in-class diesel tow capacity of up to 19,780 pounds. Now, bring support for both gooseneck and fifth-wheel towing in the mix, possible with an available prep package. Factor in optional features like trailer sway damping and a transmission-based tow/haul mode. Consider options like a class-exclusive auto-level rear air suspension system, incorporating a bed-lowering hitch assist feature. The verdict is clear: there's almost no job RAM 2500 can't handle. Choose the new RAM 2500, and you choose wraparound protection and ultimate peace of mind, both on the road and off the beaten path. That's thanks to smart technologies galore. For one, available forward collision warning with active braking can warn you of an impending accident and help you come to a complete stop, even when you've got a trailer attached. Optional features like adaptive forward lighting and a 360-degree surround view camera add situational awareness, especially during backing up, and there's also a variety of other passive and active safety, security, and driver-assist features available, from adaptive cruise control to ParkSense® front and rear park assist. 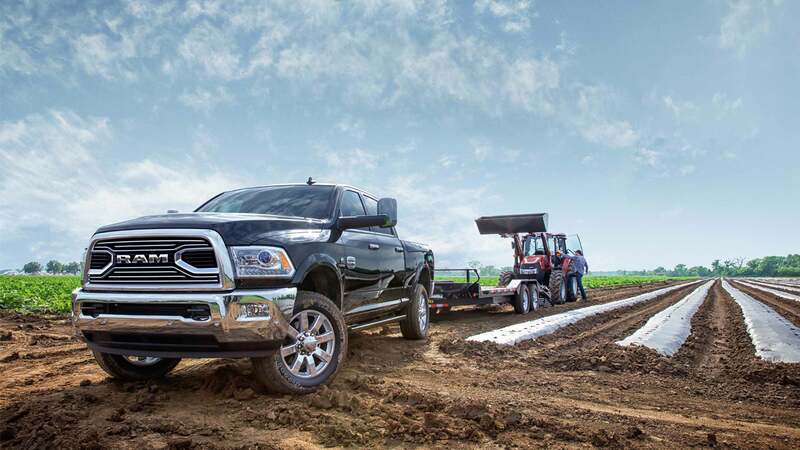 If RAM 2500 is anything, it's exceptionally accommodating, both for a team of day laborers and a boatload of gear for the grind. First, a selection of regular, crew, and Mega Cab® configurations gives way to a spacious, newly-designed interior, featuring optional full-leather seating and up to a whopping 43.3 inches of legroom thanks to a rear reclining seat in select models. Moreover, 6.6- and 8-foot box options provide enough room to transport anything from tools and outboard equipment, which you can power easily using a standard 115-volt power outlet, to a 4x8 sheet of building materials. Take advantage of the available RamBox cargo management system, and you gain rails, four adjustable tie-down hooks, a bed divider, lockable, drainable, and weather-resistant side bins, and box-area lighting -- the ideal setup for lugging essentials between job sites. 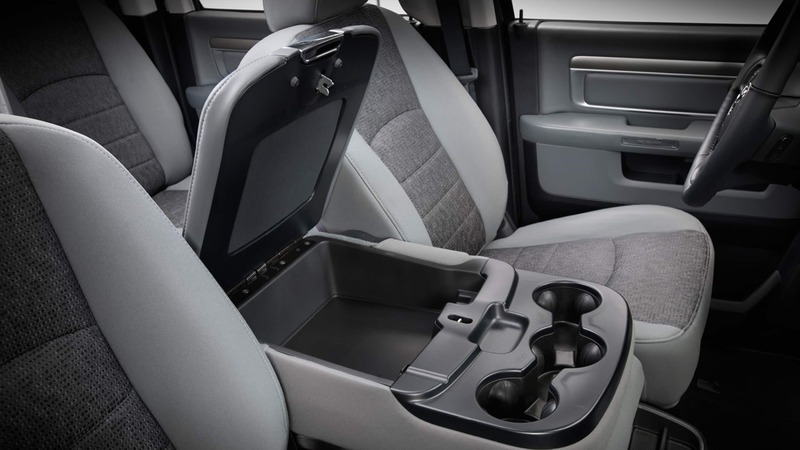 The bed's even accessible easily via a dampened tailgate, which you can conveniently open either via key fob or in-cabin from the overhead console. Furthermore, the cockpit's a veritable command center. An available 7-inch instrument cluster with reconfigurable gauges delivers critical metrics at a glance, flanked by an available and enormous 12-inch infotainment touchscreen and optional 750-watt, 17-speaker Harman Kardon premium audio. That means entertainment and settings control well within reach for the ride. What's more, with wireless phone charging support and up to 9 USB ports, integrating your electronics into a capable mobile office is a matter of course. Experience the New RAM 2500 Firsthand -- Take a Test Drive Here in Mt Sterling Today! One thing's for sure, once you've gotten behind the wheel, you'll wonder why you've ever driven anything else. Give us a call here on Alexa Drive or stop by the showroom, and we'll be glad to schedule. We look forward to seeing you soon!